Report 2011: two vintages a year! In 2011, the team had to run very quickly into action to organize the 22 and 23 April a Printemps de Cineffable somewhat special since it was the second part of the 22nd Festival (over two days in 2010). A program of 30 films and almost all unreleased from 12 countries, that showcases short films (26 in total) and documentaries (3 long and 8 short), which recorded 611 entries in 7 sessions. 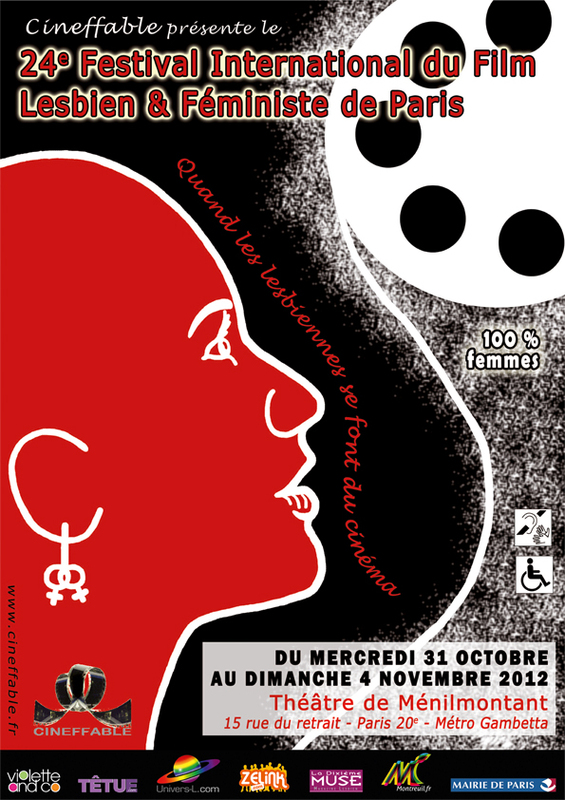 Certainly, the availability constraints of the Salle Olympe de Gouges made available by the Mairie of the 11th district have led to an unfavorable choice of dates, but a true festival took place there, with three stages of discussion and debate in a dedicated space (LGBT rights in Africa, the "Maison des femmes" of Paris and the marriage in question) with a real cafeteria. Overall, the 22nd Festival at Espace Reuilly and the Printemps of Cineffable 2011 have shown almost as many films as in previous years but up to 19 meetings a more limited audience. The 23rd Festival marks the return to all five days, although a little cramped for Espace Reuilly. And you were at appointment: 1505 adherent, 36.5% more than in 2010 and only 11.5% less than in 2009, last year at the Trianon. In a single room, the 22 projections have gathered 5617 spectators (only 15% lower than the 21st Festival, in 31 sessions in two rooms - Trianon and Halle Saint-Pierre). On average, the festival saw 255 entries per session against 274 in 2010 (and 213 in 2009). The selection offered 58 films and 5 clips, from 23 countries on all continents. The largest crowds concerning the opening night of Saturday (concert + long fiction All About Love) followed by long fiction films En Secret (503 entries) and Three Veils (488 entries), then the session short films of Saturday 17:00 (464 entries) and the beautiful Brazilian film So Hard To Forget (357 entries). Two debates were held to consider and discuss issues capital: « When a woman says NO, it is NOT! » Sunday, Oct. 30 and « Moving, in action », the militant methods of intervention relevant today, Tuesday, November 1, and a presentation of actions by Télédebout, feminist and pedagogical Web TV from Toulouse who had celebrated its first anniversary and launched the contest during the festival « Buzzons aginst sexism » open to youth 10 to 22 years, invited to submit videos made with their class or in teams on the theme of equality between girls and boys and the fight against gender stereotypes. 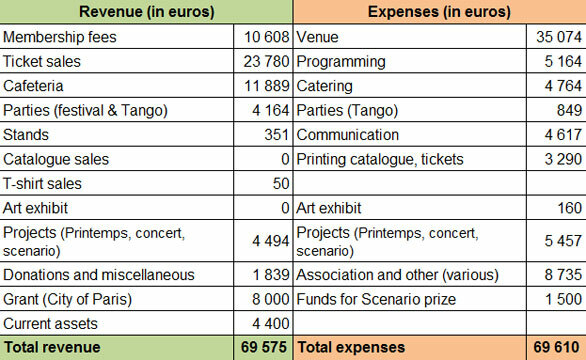 Given the duration of the festival back in five days, the 2011 figures are reported to their counterparts in 2009 and not 2010 for the detailed analysis of expenditures. The financial result for the year is almost at equilibrium. Revenues were virtually flat, with a decline of 2.24% compared to 2009. On the expenditure side, a slight increase was recorded for the site, linked to the technical installation for the projections (0.5%). It is the same for programming (5.83%) and the catalog with a circulation of over resulting in a 17.7% increase in price. Communication costs rose 6.6%, increase attributable in part to the increase in postal rates for such mailings. The cafeteria of the festival has recorded a positive result than in previous years despite difficult conditions still operating and production (catering hall and restaurant area unsuitable restricted). The 23rd Festival offered a real exposure (37% of expenditure) and one with a reasonable cost (operator's voluntary). The association recorded an increase due mainly to rent a storage box more accessible 24h/24. Bank charges have increased significantly since 2009. The Printemps de Cineffable had a very significant increase in 2011 (116%) in the case of a special edition with new films. For 2012, the financial perspective are difficult to establish. Indeed, after this Printemps de Cineffable at Espace Jean Dame, the 24th Festival se will be held for the first time at the Théâtre de Ménilmontant (Paris 20e), a new place a new place with very many areas of which only two halls of less capacity places that we have previously invested. Our challenge is to reinvent the festival, hoping either for a new cycle and not a single edition.